You know the feeling when you leave your car keys somewhere in the room, but you don’t have the slightest idea where they are? The same happens with files on a PC, except that you can use the “find” function to locate them. Let’s take a look at how to find files in Linux using the command line. Find – the basic command utility. Option – allowing you to include additional controls to the command. Path – this is where you want to look for the file. Expression – details about what you want to search. We used the “-L” parameter which signals the system to follow symbolic links. We also ordered Linux to look for all “.html” files that are located in the “/www/var” directory tree. Finally, we added the parameter that the searched files should have the chmod 666. The system will list all folders within your current directory on the screen. For the end, here is an advanced example of how the “find” command can be extremely useful. It can order your system to adjust all folder permissions to 755 and file permissions to 644 recursively. These are essentially two separate commands. With the first part, you changed the chmods of folders while the second part affected files. In this case, we used the superuser permission to find a particular “file_name.txt” in the “folder_path” directory. You can adjust the name of the file and the extension any way you like. If you compare the two previous commands, you will see that we used the “iname” option now. You might not remember the exact name of the file, but you know the extension and its approximate location. That is when you should consider utilizing the extension to search for multiple files. The above line will order Linux to display all files that have the “.pdf” extension in the “folder_path.” Please note that it is vital to enter quotes before you specify the extension and use the “*” symbol. Otherwise, the system will misinterpret your command. Here is how you can put a twist on the command that allows you to find multiple files. How about identifying all those that do not belong to a particular extension? We used the “-not” option to display files of all the other extensions except for the specified one. The above line will display all the files larger than two megabytes in the “folder_path.” If you want to search in the current working folder, enter “.” Instead of the directory path. You can also search for files less than a particular size. If you want to identify files less than 2M, enter “-2M” when you specify the size. When Have You Last Modified the Files? Another option to look for files on your Linux system is based on when you last modified them. The commands are similar to the ones you used when searching for file types. The above line will tell the system to display all the files in the particular “folder_path” that you modified within the last 10 days. find /root -mtime 10 -name "*.pdf"
An alternative way of using a modification date to find a file is to use the “-daystart” parameter. The above line orders Linux to show all the files in the specified folder that were modified 10 or more days ago. The “perm” function will allow you to find files depending on the given permissions. The option may be useful if you want to ensure that you haven’t made a mistake of giving different permissions than planned to a particular file. The OS will list all the files in the specified folder that have 666 permission. Once you identify one that doesn’t belong to that group, use the “chmod” command to change its permission. You can also use prefixes that will modify the search in various ways. The most commonly used prefix is a slash (/). It will tell Linux to show you the files that have the specified permission for one of the categories (others, group, or user). Alternatively, you can also use “-“ as a parameter. For example, let’s say that you want to look for files that have read and write permissions by all the categories (owner, group, others). The first account name specifies the current owner while you use the “chown” parameter to change the ownership to the second account name. If you want to shorten the process of deleting the files, you can use the “find” command to remove them. In this case, you will delete all pdf files in the directory tree of “folder_path.” You should be extremely careful with the delete parameter because you don’t want to end up deleting files that you need. 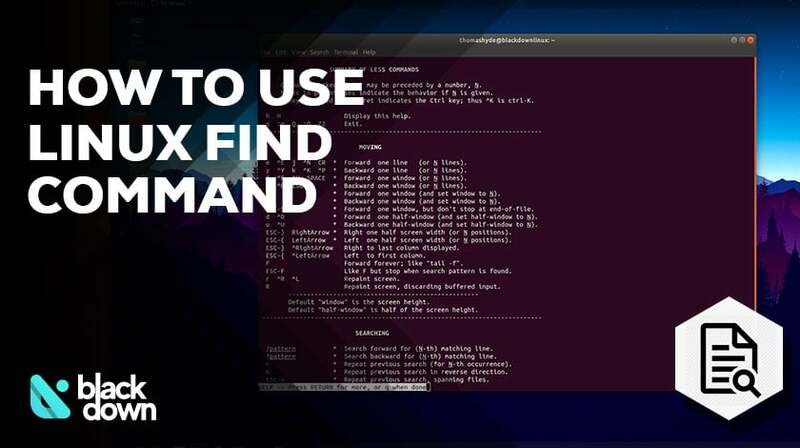 You can use the “find” command in Linux in many different ways. We covered the most commonly used ones in this guide. In the end, allow us to remind you that you can always type “man find” to learn more about what you can do with the command.